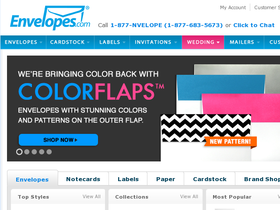 For all your envelope needs, shop at Envelopes.com. Envelopes.com is a leading supplier of plain envelopes, and printed envelopes in all styles, colors, and designs. Envelopes.com has envelopes for all purposes, including business envelopes, invitation envelopes, social envelopes, and shipping and packaging envelopes. Envelopes.com also supplies a selection of paper, cardstock, invitations, greeting cards, business cards, and post cards. With such a wide selection, Envelopes.com is sure to offer the types of envelopes you need. But before you shop, be sure to get all the latest Envelopes.com discounts, Envelopes.com promotions, and Envelopes.com coupon codes found here at RetailSteal.com. Envelopes.com ships within the United States, U.S. territories, and several international locations, including Canada. See site for shipping options. Shop at Envelopes.com and enjoy $10 savings on orders $125+. Click here for code. Click the link to shop at Envelopes.com now and use our coupon code to save $5 on your $50+ purchase. Take 10% off your entire order when you purchase an Inside the Envelope item with any other item. Click here to shop. Enjoy a 10% discount on your entire order from Envelopes.com when you use this coupon code online. Use code on orders of $250+ to qualify. For a limited time, orders over $250 are qualified for free ground shipping from Envelopes.com. Click here for code. Shop at Envelopes.com and enjoy free shipping on orders $250+. Click here for code. Sign up for the Trade Discount Program online at Envelopes.com and save up to 25% on purchases. Click here to sign up today. Join the Non-Profit Discount Program at Envelopes.com and save up to 25% on purchases. Click here to get started. Sign up for the loyalty program at Envelopes.com and save up to 15% on purchases. Click here to start. Click here to check out the collection of eco-friendly recycled envelopes from Envelopes.com. Click link to shop.